I will be taking a blogging break and will be back in 2013! See you in the new year. I think all three covers are good but I like 1 and 3 the best. 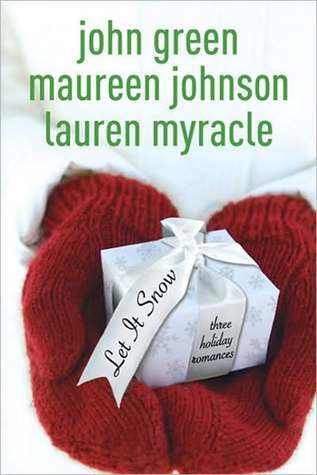 About the Book: Let It Snow is a new holiday offering from three popular teen authors. Each author contributed a holiday romance short story to add to the collection. Maureen Johnson starts things off with The Jubilee Express, in which Jubilee (no, not a stripper, but named for a piece in her mother’s collection of the Flobie Santa Village) finds herself stranded on a train in Gracetown in a huge snowstorm. A trip to the Waffle House introduces her to Stuart and friendship, or maybe something more, starts to form. In A Cheertastic Christmas Miracle, author John Green hilariously describes the mission of three friends to get to the Waffle House where a group of cheerleaders are stranded and wanting to play Twister. And Lauren Myracle’s The Patron Saint of Pigs shows that lost love can be found again with the help of Starbucks, angels, and even a pig. GreenBeanTeenQueen Says: I’m a sucker for romance any time of the year, but something about the holiday season makes me want to curl up in a nice blanket, drink hot chocolate, and read love stories. 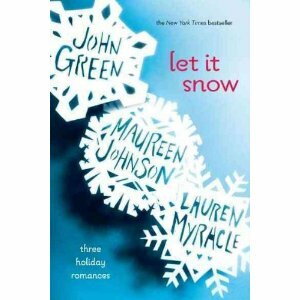 Let It Snow is the perfect holiday read. Each story stands well on its own, but it was nice to have a common thread throughout. I loved how the authors found ways to connect all three stories. Characters you meet in the beginning show up later on, and places like Starbucks and the Waffle House are important to all three tales. The only thing I didn’t like was that they were all short stories - I could have kept reading about each of the characters! Let It Snow is a great, warm, fuzzy read for the holidays, so grab some hot chocolate and curl up because you won’t want to stop reading until you’re finished and happily sighing. Full Disclosure: Reviewed from personal library copy purchased from Borders. First reviewed in 2008. Here's your most recent update!! A new (not so) secret Harry Potter mini film is being filmedto air in the Harry Potter Wizarding World Theme Parks. This makes me want to visit the park even more!! Unwind, the very creepy dystopian novel by Neal Shusterman, has been optioned for a film by Constantin Films! It’s about time! Daughter of Smoke and Bone is one step closer to the big screen as the studio is making the filma priority. Yay!! The CW, the network otherwise known in my head as the YA toTV network, has developed a Hunger Games style reality show. It’s billed as a survival show-let’s just hope it’s not as evil as the games. What do you think about a survival reality show for teens? All I know is I’d fail out immediately. The Vampire Academy film is getting closer to the big screen with a screenwriter attached and thescript finished. Maybe it will head our way soon. Reboot is a YA novel releasing in February 2013 byHarperTeen, but it’s already been picked up by Fox 2000 and has a screenwriterattached. Dystopian novel Monument14 is been picked up by Reel FX for the big screen and has director attached. Warner Brothers is adapting Dan Gutman’s middle grade novel, The Genius Files. I love that middle grade is getting some love! Jumanji is getting a second big screen incarnation (the first was the 1995 film). Columbia is adapting the book for the big screen. Thanks to Cynopsis Kids for the news. A Harry Potter shop has opened at Platform 9 ¾ -Why wasn’t this done years ago??? Please welcome author Karen Cushman to the blog! I am so delighted to be hosting Karen Cushman on tour for her latest book, Will Sparrow's Road. I have been a long time fan and no one writes historical fiction like the amazing Ms. Cushman. Her latest book is a bit different-this is the first male narrator for the author! Here's Ms. Cushman to talk about why she chose to write from a male point of view this time around. Why did I write a book about a boy? I had in mind a story about a child alone and on the road in Elizabethan England. I knew a girl likely would not survive there in those somewhat brutal times. And I don’t believe that in a world with so little privacy, she could successfully disguise herself as a boy for long. She wouldn’t have access to a private bedroom or dressing rooms or bathrooms. London did have one public restroom—a plank with 18-holes, emptying directly into the Thames River. In fact using the whole world as a toilet—streets, fields, the halls of great houses—was so common that a book of manners from 1731 stated that it was impolite to stop and greet someone who is urinating. So it had to be a boy, and Will Sparrow was born. It was important to me to build a Will who was believable, true to his character, his gender, and his times. My first attempts made Will more like a girl in britches so I had to do a lot more research. I read books on psychology and child development. I spoke to boys and mothers of boys. I watched boys at the bus stop and my husband and his friends at play. The resulting Will has boundless energy, his voice is changing, he distrusts displays of emotion, and he longs to grow facial hair. But he lives in a time that was more chaotic and dangerous so he is extremely vulnerable. There was no concept of adolescence so a boy of thirteen, no longer a child, was considered a man, with the responsibilities of a man. I hope I have managed to construct a Will who is believable, not a stereotype, and wholly entertaining. Let me know what you think. I love Will Sparrow and his journey and I think Ms. Cushman has captured the tween boy voice perfectly! This week is a big deadline for all of my committee reading. So as I'm working my through my reading and nearing that deadline, I've decided to take a blog hiatus for the rest of this week. Here's your latest roundup of YA Movie News-lots of exciting things happening!! -SLJ's Connect the Pop has a great guest post up about what readers should know about YA Movie adaptations. Lots of great info! -I discovered a fabulous list of YA book to movies kept by The Young Folks. Check it out-all the latest updates about what books are heading to the big screen and what happened to those that were optioned and we haven't heard anything about. -Strange Chemistry announced that Blackwood by Gwenda Bond has gone into development for a TV Series with MTV. 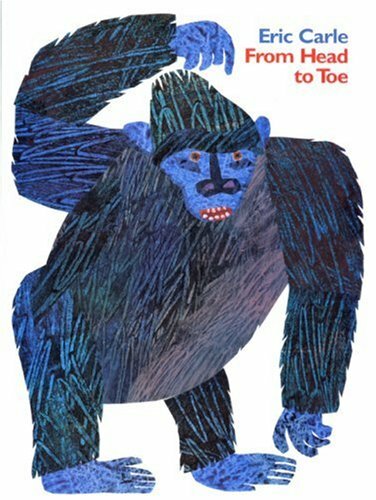 This book is based on a very intriguing mystery and I think it could make a great TV show. -Hush, Hush by Becca Fitzpatrick has been optioned for a film. The book is full of drama and romance and could be popular as Hollywood is looking for the next big YA hit. -BBC is adapting J. K. Rowling's A Casual Vacancy for TV. Maybe if it happens it will air in the US too? -NBC has hired Jullian Fellows (Downton Abbey creator) to create a series for the US based on The Gilded Age. Still very early news, but I'm pretty excited about it. I hope it works out! Thanks to Cynopsis for the news. I've got more hardcover to paperback changes! What do you think of these? 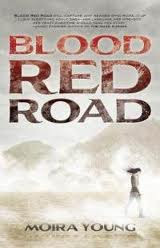 -I think both of these are well done and reflect the bleakness of the landscape in the story. -I'm not a big fan of either covers, but I gotta got with the hardcover because it's creepier. -I like the hardcover on this one. The paperback is too simple and I think the hardcover has a cool computer/techy/time travel feel to it which matches the book. -The paperback for this one changes the entire look of the book! Now it looks like a steamy romance novel instead of historical fiction about Catherine Howard. I'm sure the paperback will get people to pick it up, and there is a lot of intrigue in the book, I'm just not sure it matches the steaminess on the cover. One of the joys of working at the library is that I get to work with lots of wonderful people who geek out about the same things I do! One of my coworkers (C.) is a huge Tolkien fanatic, so she organized a giant series of programs called Tolkien Fest. The library district hosted programs kicking off with Bilbo's birthday in September, book discussions and a Tolkien Scholar talk in October and November and culminating in watching all three Lord of the Rings movies on the library's big screen in December. I used the nametags and dwarven runes from Houghton Mifflin's Hobbit Day Event Kit. I was very lucky to have C. come up with Hobbit first names (male and female) as well as last names. We separated them into different baskets, labeled them and then had people pull their names as they came in. I used a mix of trivia questions. C. made a very tricky quiz for fans and I made a simple trivia sheet for the youngest of patrons-easy questions like "what is the wizards name?" and "where does Bilbo live?" I also printed off the trivia quiz from Houghton Mifflin included in their Hobbit Day Event Kit. 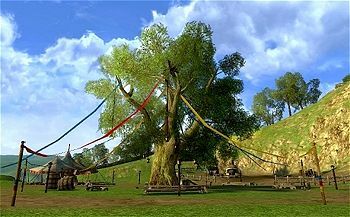 I had another event kit from a Hobbit Second Breakfast site that appears to no longer have the event kit up. There was a word search included that I put out at station two. There are others available online that could work. This one didn't work exactly the way I had planned, but still worked. I bought graham crackers, white frosting (dyed green), vanilla wafers, pretzels, and goldfish. I didn't have time to make a sample beforehand, but I was picturing the graham cracker as a base, laid flat, covered in frosting, with a vanilla wafer as a round door, pretzels to make trees, and fish in a pond. Basically using the graham cracker as a canvas for the rest of the picture. Instead, it turned into gingerbread house style hobbit homes. It still worked, but was much messier. Thank goodness for tablecloths! I put out paper (long paper that looked like a scroll) as well as simple instructions explaining what limericks and haikus were. Since Hobbits love riddles, this was a fun way to incorporate that-and the kids were very creative! Ok, this one is a bit of a stretch, but I really wanted to make this craft! I got the idea in a library workshop, but you can find the instructions laid out on a blog post by Teaching the Little People (thanks Pinterest!) I am so no crafty and I can make this one! You take a round shower curtain ring and plastic tablecloths (I used pink, green, and white-I thought they seemed Hobbitish). Cut the tablecloths into strips, tie them around the shower curtain, and you have instant simple streamers that are lots of fun! I did see an idea about gluing string to your feet, but ewww! We went much simpler. I provided string (I pre-cut mine, but you don't have to), crayons, and paper. I gave the kids instructions to trace their foot, then cut the foot out, make it Hobbit foot hairy and then tie it over their shoes. I was thinking they could tie them around the ankles but some patrons got really creative lacing their new feet into their shoes! All the other stations were set up around the room, with Pin the Ring on Bilbo and the lawn games in the middle. And what Hobbit birthday party would be complete without games? This also provided another activity for the kids who wanted to be very active and sped through everything else. My coworker C. is pretty amazing. She created a huge wanted poster for the party by printing off the movie stills of each of the dwarves, Bilbo and Gandalf and titled it "Middle Earth's Most Wanted." I hung it up on one of the room walls (It was so large it took up the entire wall!) with an instruction sheet that asked if they could name each character. I also provided a list of character names. (Hint: they were all in alphabetical order!) The teens that attended loved this and I overheard them arguing over who actually had the characters correct and if they matched the descriptions in the books. I printed off seven pictures of Hobbits (all seven pictures were the same). I asked one of my employees to hide them around the library so even I didn't know where they were. She did a fantastic job hiding them secretly, but not so secretly they couldn't be found. You just had to look a bit to see them. She put one in each department (children's, YA, circulation, reference and local history) as well as hid one in the reading room window and the other above the Fantasy shelves in fiction. This was an activity we left up all day and it was a good way to manage the crowd in the program as we had people going back and forth. Parents and kids alike kept asking where all the Hobbits were-and they were tricky to find and stumped many people. They all asked us to do another scavenger hunt and said they loved this part of the program. And of course, it was a birthday party, so we had to have cake! So there you have it! 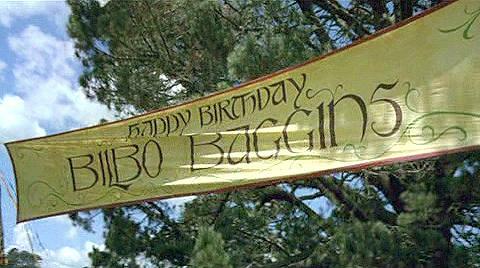 My very extensive and fun Hobbit Day Celebration. It was a blast and everyone loved it. We had some patrons come in costume, others in Lord of the Rings t-shirts. This was a program I advertised for all ages and I truly had all ages. I had everyone from babies to seniors (with lots of tweens, teens and college students in between-and you know how elusive they can be when it comes to library programs!) Overall it was a fantastic program and I would happily repeat it. The Wright and Wong Mysteries by Melinda Metz and Laura J. Burns were first published in 2005. The books feature two tween detectives who couldn't be more different- B. Orville Wright has Aspberger's Syndrome with a high IQ and great eye for detail where Agatha Wong is able to see the big picture. Together they make a great detective team. This series is especially important because it features a main character with Aspberger's Syndrome. This is such an important topic and kids need to see main characters with Aspberger's and Autism featured in books. 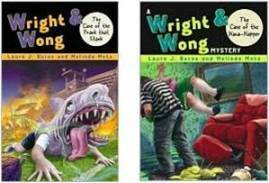 Authors Melinda and Laura have put together a petition asking for The Wright and Wong series to go back into print. If you believe in this important topic and series, please sign the petition. Hopefully together we can bring this great series back into the publishing world and into the hands of tween readers. -I gotta got with the paperback on this one. It just looks more appealing to me. -I think both covers are appealing. I think the paperback has more action and the hardcover is more subtle, but both fit the book well. I think I still like the hardcover better. -The paperback looks like a comic book. It's still really cool and I think this cover change is interesting because I think each cover markets to a different group. The first looks like fun and fluffy and the second looks more serious. I'm not sure which one I like more. -I love both of these covers, but I think I like the darkness of the paperback. I do think the hardcover has more of a Sleeping Beauty feel which matches the book. So which ones do you like or dislike? Opening Song: I recently started doing two opening songs (Wake Up Hands off a CD that I can't remember the name of right now! and Finger Poppin by Georgiana Stewart) I got the idea from another branch in our library district and I like that it gives parents and kids just a bit longer to arrive. Racing to Read Skill: Talk and Read-we were exploring lots of winter words in our storytime this week! 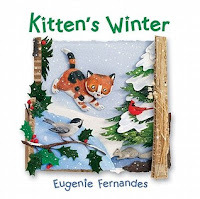 Read: Kitten's Winter by Eugenie Fernandes (for toddler storytime)-I love this book because it has great pictures and vocabulary-"scurries, burrows, dozes"-so fun! 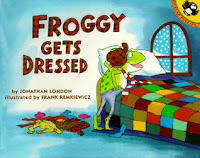 Froggy Gets Dressed by Jonathan London (I used this one in preschool storytime)-this one gets lots of interaction from the audience and the kids and parents both loved it. "And I read, read, read, and I look, look, look"
Flannelboard: (I used this with both age groups). 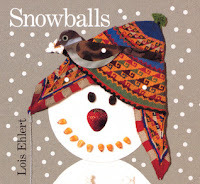 This was in our Winter Storytime collection that we have on hand. It came from Children's Programming Monthly Vol. 1/No. 4. Hey, Mr. Snowman, what do you need? I need some eyes, put them on me please. Hey, Mr. Snowman, what do you see? I see an orange carrot. Put it on me please. I see a purple hat, put it on me please. I see some red licorice, put it on me please. I see some brown sticks, put them on me please. I see a green scarf, put it on me please. I see red mittens, put them on me please. I see yellow boots, put them on me please. I see a snowman, happy as can be. Read: Snowballs by Lois Ehlert-my favorite winter themed book ever!! I used it with both groups and they all loved it! -Snowball Chute-we have a large box with a tube in it that we use as a ball chute. We used plastic softballs as "snowballs"
-Snow Fort Building-The greatest thing we have in our activity stash! We have giant foam blocks that come in our computer packages and they are sturdy enough for the kids to build with. They are always a big hit! 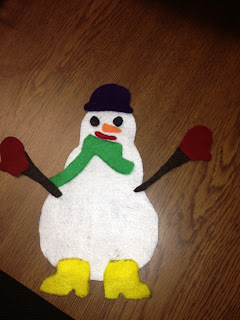 -Flannel Snowmen-We had several flannels of snowmen in our Winter Storytime supply, so I put those on a mat with additional books. 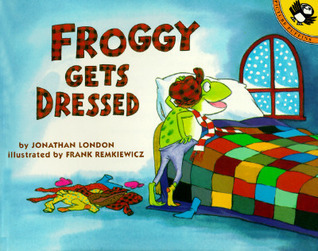 For the preschool group I also put out the flannel we have of Froggy Gets Dressed so they could retell the story.